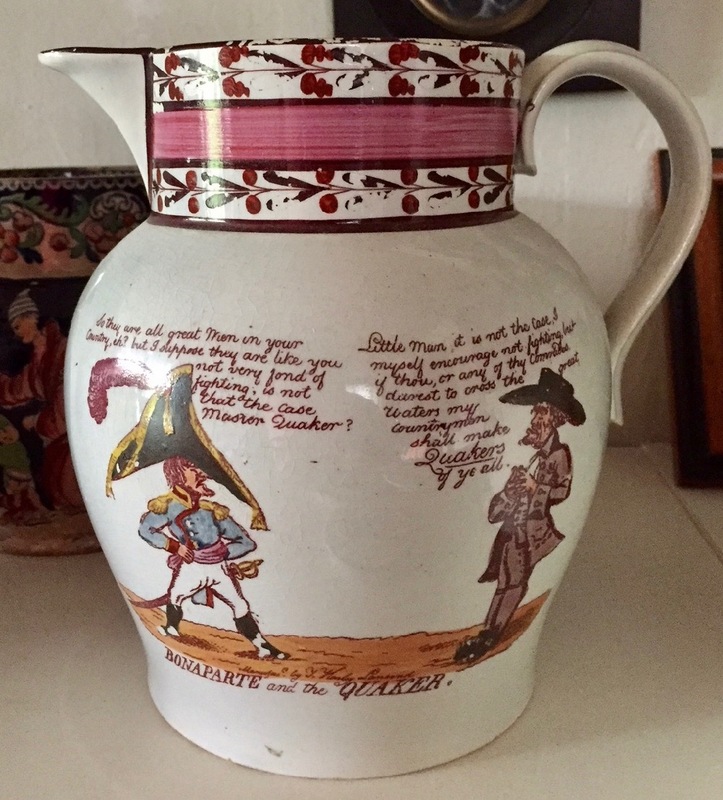 T. Harley 6.5 inch jug, "Bonaparte And The Quaker," ca. 1802-1808. Serendip is a place I arrive at often when I search for transferware patterns. 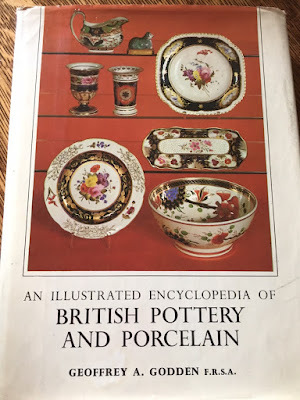 My search recently took me to Geoffrey Godden's book, "An Illustrated Encyclopedia Of British Pottery And Porcelain," which was published in 1965. I was looking for a basket undertray or stand on p. 176, but the photo below the stand caught my attention. 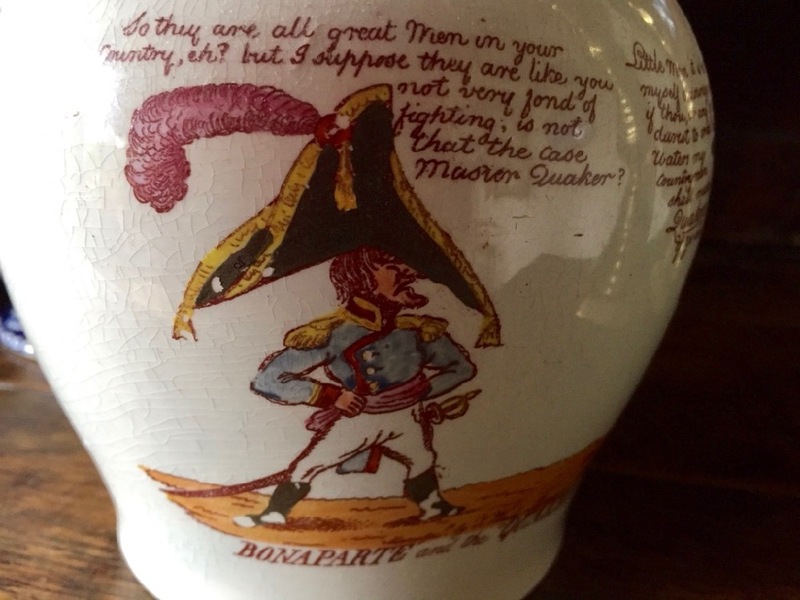 It showed a jug titled "Bonaparte and the Quaker," and I realized the identical jug was on my shelf! 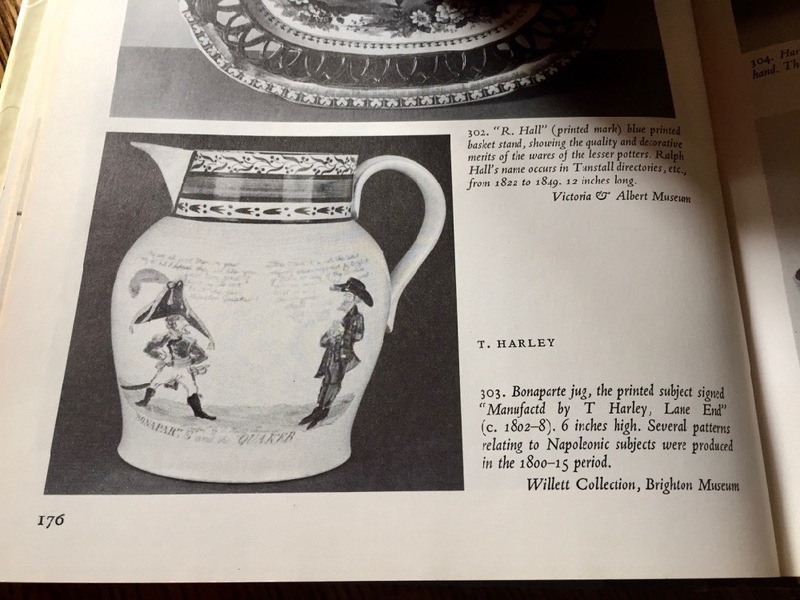 The only difference is that the jug in the book is signed on the bottom, "Manufactd (sic) by T Harley, Lane End." 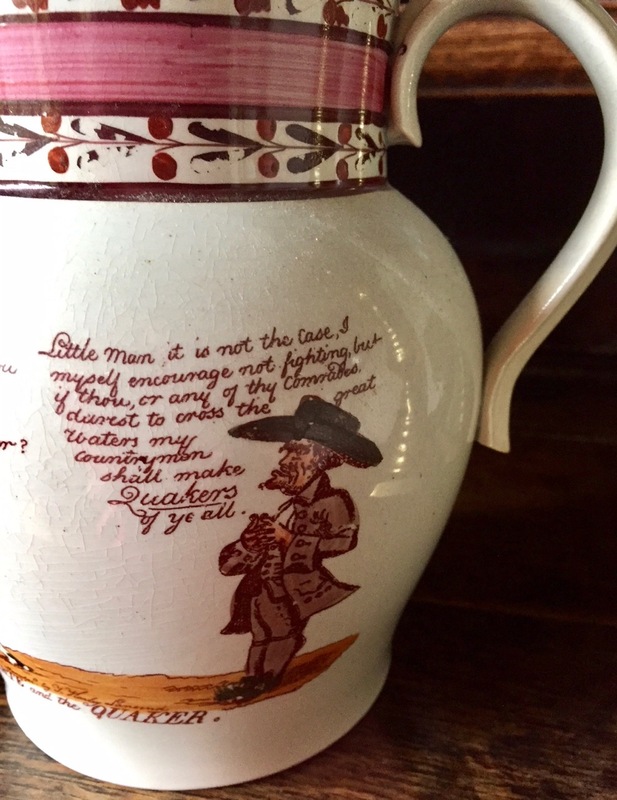 The commentary on the jug is like a political cartoon on transferware. It makes fun of Napoleon and touts the superiority of even a peaceful Quaker! The text is hard to read, even enlarged, so here are close-ups. You can click on them to make them larger, but I'll add the text to the caption below. "So they are all great Men in you Country, eh? 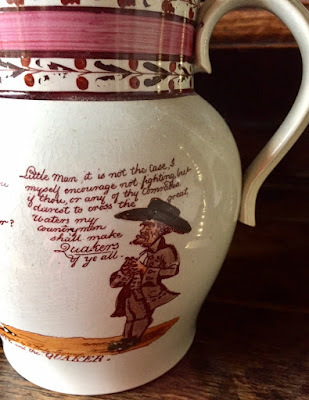 but I suppose they are like you not very fond of fighting; is not that the case Master Quaker." The punctuation is not mine! "Little man it is not the Case, I myself encourage not fighting, but if thou, or any of thy Comrades darest to cross the great Waters my countrymen shall make Quakers of ye all." The pattern is based on a source print, a political cartoon, that has been in the collection of the British Museum since 1868. 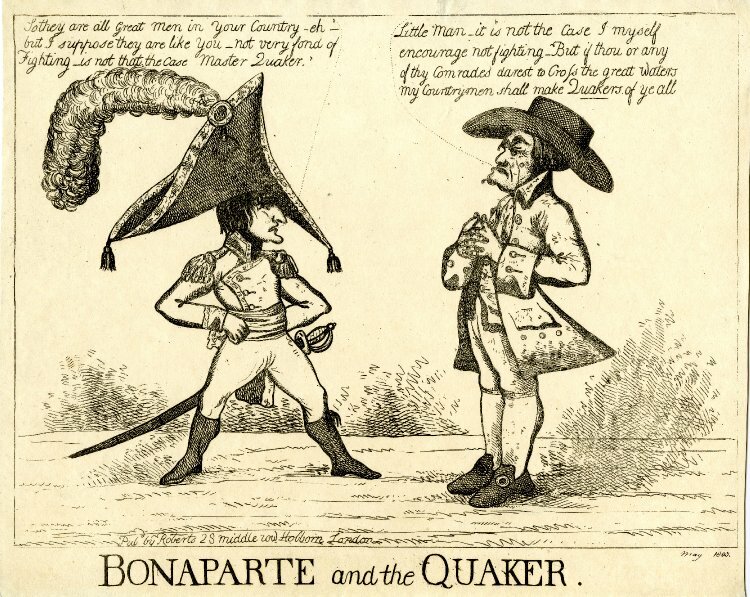 "Bonaparte and the Quaker" from the collection of the British Museum. 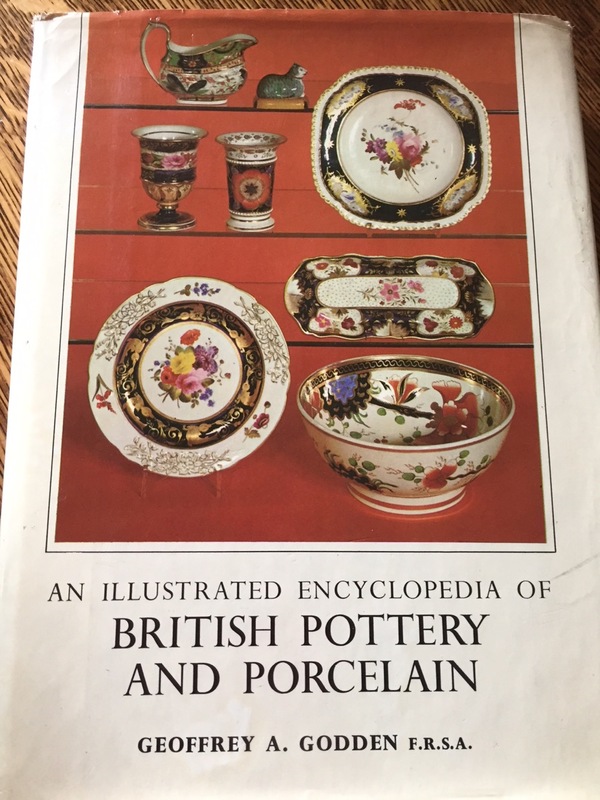 It is dated 1803, and says it was "Pubd by Roberts 28 Middle Row Holborn London." You might wonder what is on the other side of the jug. Perhaps another jibe at Napoleon? 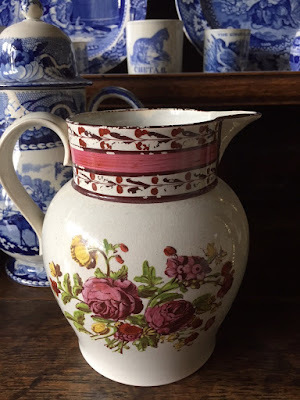 There are just some lovely flowers on the other side of the jug. English roses? Here's the page from Godden's book. And the cover. I have owned it for a long time, but haven't looked at it for quite awhile. It's good to remember old friends. I've had this book since it came out, same dustjacket. Also the accompanying mark book. They've survived many clearouts over the last 50 years. Which is great as only now am I returning to a youthful interest! Wonderful that you kept the book. It's a treasure.